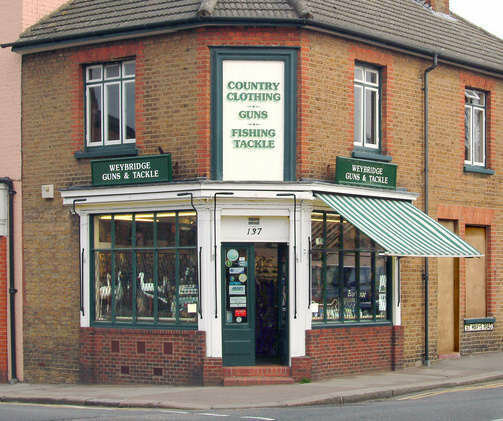 We are a small traditional Gun, Country Clothing & Fishing Tackle shop situated in Oatlands Village on the outskirts of Weybridge, Surrey. We do not sell online, we feel that the goods we sell need to be handled before purchase, the buying experience being fully backed up with our advice, gleaned from over 48 years in the business. Very sad news I'm afraid, my lovely wife & backbone of the shop, Mary, passed away peacefully on Sunday March the 4th. I will continue to run the shop with the limited opening times shown below and see how I cope, hopefully we will trade for many more years yet. Please keep coming in but do bear with me, operating with new assistants, not Mary, may mean slightly slower service while they learn the ropes. Opening Hours :- From Sept 1st 2017 we are open on Thurs, Fri & Sat only 10.30am to 5.00pm.